Make Your Norway Rats a Thing of the Past - Yes Pest Pros, Inc. Make Your Norway Rats a Thing of the Past - Yes Pest Pros, Inc. There is no doubt that the country of Norway is one of the most beautiful in the world. Dramatic fjords, snow-capped mountains and rugged scenery abound. Too bad the rat of the same name isn’t as much fun. The Norway Ray is the most common rat in North America and it has been a much-hated companion of humans for eons. While the easiest way to rid yourself of a Norway Rat problem is to call Young Environmental Solutions, you can take some positive rodent and rat control steps on your own. There are two main reasons why a rat chooses your home over your neighbors: food and a warm place to sleep. Since you likely won’t be turning your heat off in the middle of winter to freeze out an unwanted rat, the best place to start is with controlling the food supply. You’ve likely already found rat droppings, chew marks around the house and other signs of infestation. Start in your kitchen and secure all loose food. You can buy glass, flip-top jars for a dollar or two apiece at a local store. They are the perfect foil for a rat. 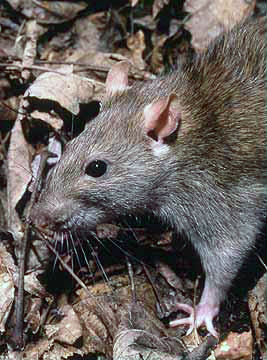 Zip-top bags can be chewed through, especially by larger rat species like the Norway rat. Once everything in your cabinets and pantry is secure, it is time to start cleaning. Pest control experts will tell you that rats aren’t exactly picky eaters. Most of us have loose crumbs, stray pieces of cereal and other food items lying under our fridge, in our cabinets and in our pantries. We obviously wouldn’t eat these items under any circumstance, but rats consider this to be a buffet. It is time to grab the vacuum and start cleaning. It is only when all known food sources have been removed that our rat friend will begin looking for other accommodation. One of the advantages to calling a pest control company is they can help you find the entry point that rats and other vermin are taking to get into your home. Rats are very resourceful and their entry point may not be obvious to the untrained eye. You’ll likely not find a perfectly round mouse hole like in the cartoons. Sealing that hole will not only keep your home free of invaders but it’ll also help you save on heating and cooling bills. A double win and all the more reason to call the residential and commercial pest control experts at Young Environmental Solutions.